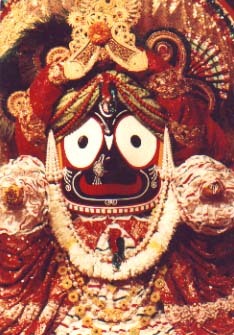 "A pure devotee who knows the science of Krsna consciousness makes no distinction between Lord Jagannatha and His body. He knows that they are identical, just as Lord Krsna and His soul are one and the same. When one's eyes are purified by devotional service performed on the spiritual platform, one can actually envision Lord Jagannatha and His body as being completely spiritual. The advanced devotee, therefore, does not see the worshipable Deity to have a soul within a body like an ordinary human being. There is no distinction of the body and soul of Lord Jagannatha, for Lord Jagannatha is sac-cid-ananda-vigraha."